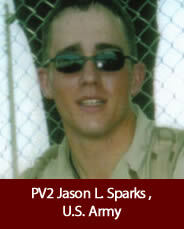 PV2 Jason L. Sparks was born June 22, 1985, on the MacDill Air Force Base, Tampa, Fla. Jason is the son of SMSgt (Ret) Scott & Lisa Sparks, and has one sister, Sarah. He was a 2003 graduate of Monroeville High School where he played football and baseball. He was a member at the Congregational Community United Church of Christ in Monroeville. Jason was a huge Cleveland Indians fan, and when he played high school baseball, always did the “Jim Thome pointing the bat to the outfield”. After Jason’s passing, his sister, Sarah, then did it in her softball games to honor Jason. Jason also coached baseball in the summers, enjoyed hunting and spending time with his family and friends. Jason enlisted into the Army in February and went to South Korea in June. He then shipped out to South Korea in June 2004, then went Kuwait and before arriving in Iraq with Company C, 1st Battalion, 503rd Infantry Regiment. Just one week after arriving in Iraq, Jason was killed in action when his platoon was engaged in direct fire in Fallujah, Iraq on 9 September 2004. Jason was an extremely outgoing person, and was a big hugger. Jason loved everyone he came in contact with, as he didn’t have a shy bone in his body. Jason often talked about serving his country, following in his father’s footsteps. He was a very patriotic young man, who also rooted for THE Ohio State Buckeyes, the Cleveland Browns, and of course his home town team, the Monroeville Eagles.